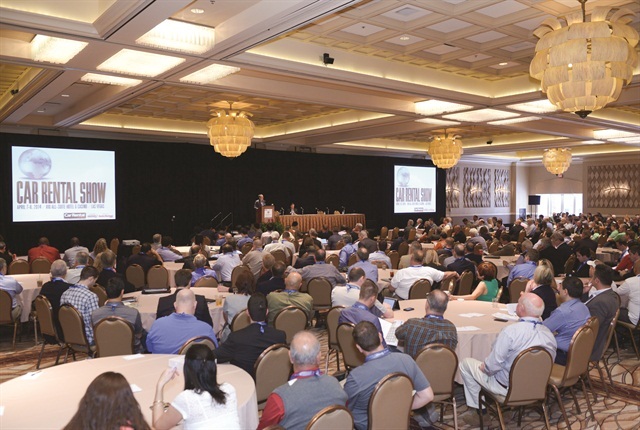 Some 800 attendees convened at the Rio All-Suite Hotel & Casino in Las Vegas from April 7-8 for the 2014 Car Rental Show, a doubling of attendance since 2009. Photo credit: Jann Hendry. 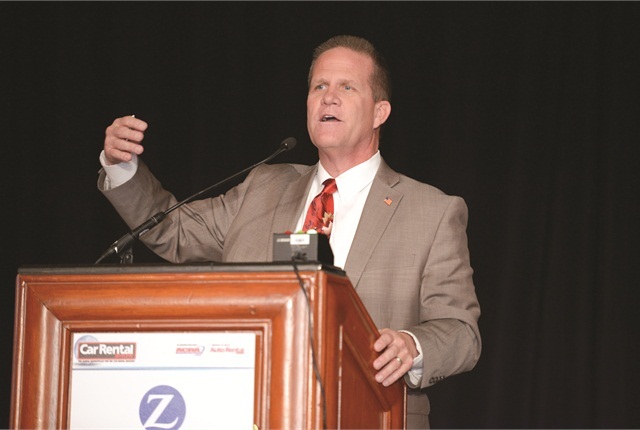 Designed as the global marketplace for the car rental industry, the 2014 Car Rental Show (CRS) drew some 800 attendees from North America and overseas. International attendees represented 33 countries, including China, Korea, Japan, South Africa, New Zealand, Brazil, Argentina, United Arab Emirates and countries across Europe. 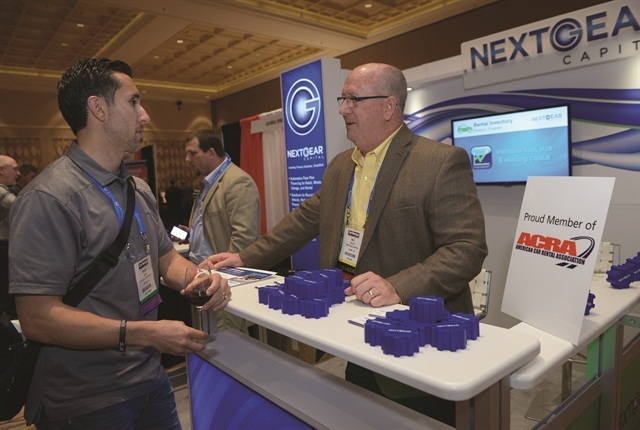 Held in partnership with the American Car Rental Association (ACRA) at the Rio All-Suite Hotel & Casino in Las Vegas from April 7-8, this year’s conference — now in its 19th year — featured an expanded agenda and exhibit hall, year-over-year growth in attendance and a solid international presence. Pat Farrell, the chief marketing and communications officer for Enterprise Holdings, gave the conference’s keynote address. 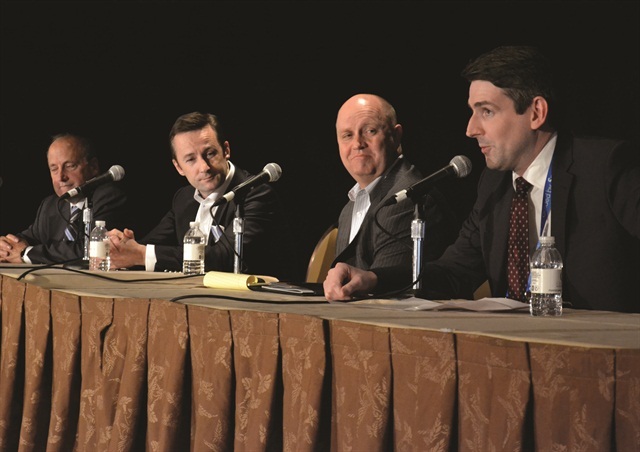 In “The Future of Auto Rental: From Global to Local,” Farrell noted that the car rental industry is experiencing major change from such factors as new technologies and evolving consumer preferences. He cited changes in customer preferences due to new digital and mobile technology as the largest driver of change — and opportunity — in the industry. 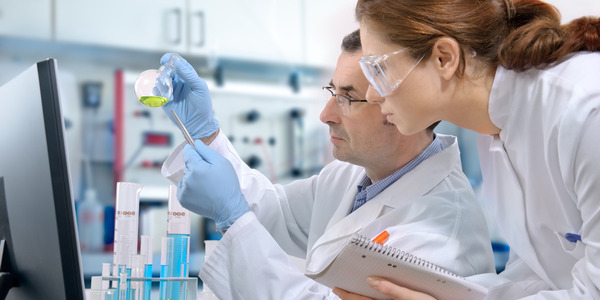 Farrell also called attention to issues that threaten the industry’s future growth and viability. Farrell noted that every state now has some type of excise tax on car rentals, and that car renters have paid billions in car rental excise taxes at the state, county or municipal level. “We object to the excessive and undue burden of excise taxes that single out our customers to carry a disproportionate share of the funding burden for local projects such as sports stadiums, arenas and art museums. Taxes should be fair and just and should not single out customers of just one industry,” he said. In Tuesday morning’s breakfast keynote, Dr. Craig Manning, author and Olympic sports psychology consultant, recounted his experiences as a consultant to gold medal-winning teams at the Sochi Winter Olympics. Manning gave attendees a taste of his Fearless Mind methodology, designed around the psychological principles of the mind to help maximize human efficiencies. 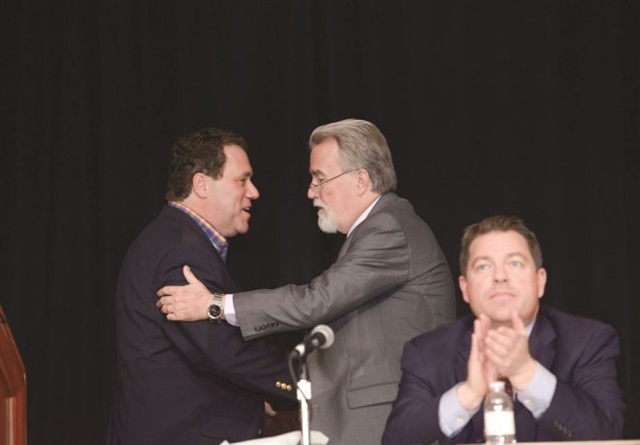 Nevada Sen. Mark Hutchison joined Nevada Sen. Michael Roberson during the ACRA panel to discuss how an industry can affect change through its association and grassroots lobbying efforts. Photo credit: Jann Hendry. The ACRA board of directors led its annual association update and seminar with a panel that included Sens. Mark Hutchison and Michael Roberson of the Nevada Senate. Roberson also explained the importance of lobbying. “If you don’t have someone who knows how to sit at the table and communicate, you’re in trouble,” he said. “Tell lawmakers that you live in their districts. Remind them that you elect them,” Hutchison added. During the panel, ACRA named Joe Knight of Fox Rent-A-Car its new president, replacing Bob Barton after his six-year term. The ACRA board presented Bob Barton with a plaque honoring his service to the association and the industry. The plaque reads, “We are our own worst enemies when we choose not to work together on legislative and tax issues,” Barton’s mantra during his tenure as president. The conference festivities kicked off on Sunday night with an opening cocktail reception, now in its third year. On Monday morning, the second annual First-Timer’s Orientation featured a networking session with mentors and mentees. Seminar topics included the annual interactive discussion by Leslie Pujo of LaPlaca Pujo, P.C. on rental vehicle law changes from the past year and best practices for rental car companies. 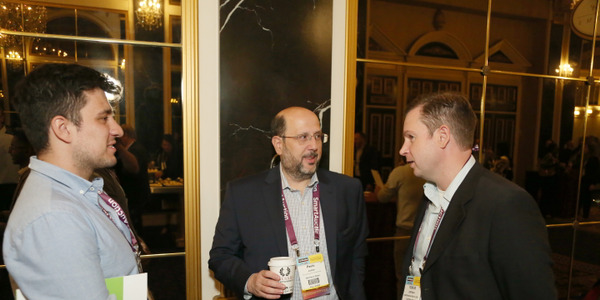 Concurrent sessions featured topics such as combating credit card fraud, a loss-of-use deep dive, utilizing the latest rental technology, harnessing big data and the impact of pricing, volume and performance on residual values. 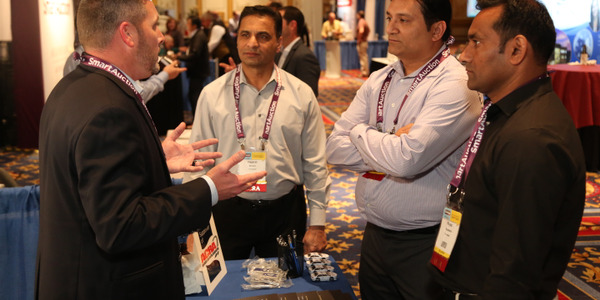 New for 2014, the Car Rental Show featured 10 different interactive roundtable discussions. 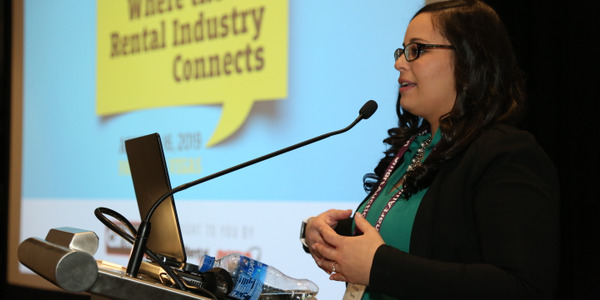 In 20-minute sessions, group facilitators covered topics such as customer service in the age of social media, best practices in car key management, tips for counter sales and implementing self-service car rentals. The two-day show concluded with a special closing session on the issue of prepaid reservations. 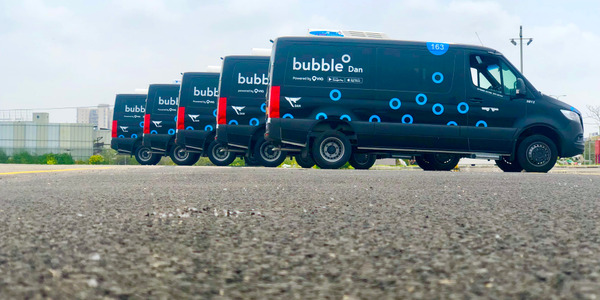 A panel of experts analyzed the topic from all sides, including operations, customer service, revenue management and IT as well as OTA and GDS connectivity. 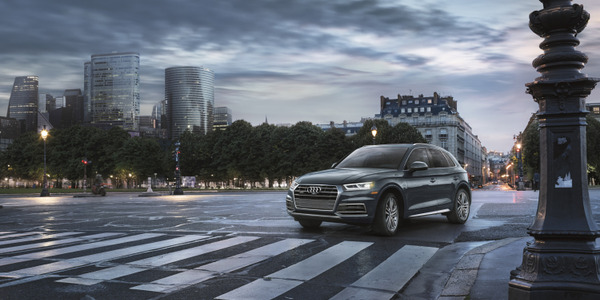 In lieu of being able to guarantee a car rental reservation with a deposit — which appears unlikely to gain consensus and traction — a prepaid reservation is seen as the next best thing to better manage utilization and no-shows. Panelist Dr. Stowe Shoemaker, a professor at UNLV’s Harrah College of Hotel Administration, stressed the importance of offering a discounted price to encourage rental customers to prepay for a vehicle. Without a prepaid reservation, many consumers will continue to search for cheaper prices. “How can we get someone to commit ahead of time and not continue to look for other rental car options?” Shoemaker asked the audience. Panelist Kevin Stutz of ACE Rent A Car reported transaction data that a discount as low as 5% was enough to get people to prepay the booking. Doris Cassan received this year's Russell Bruno Award for outstanding service to the auto rental industry. Cassan, a longtime Dollar Rent A Car licensee since 1968, has locations in Seattle and Portland. Photo credit: Amy Winter. 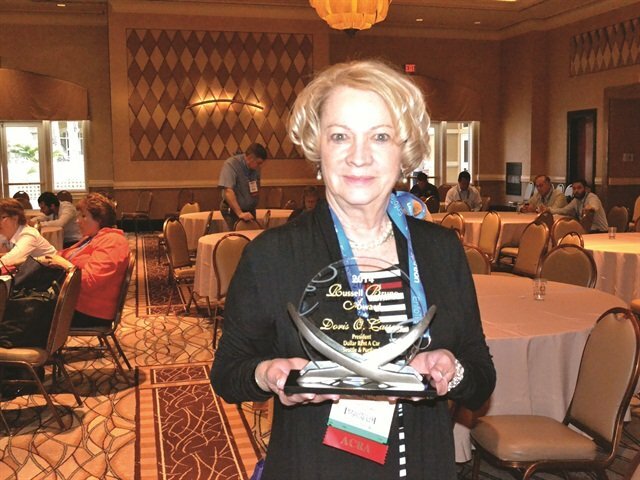 Doris Cassan received this year’s Russell Bruno Award for outstanding service to the auto rental industry. Cassan is owner of CMC Investments Inc., a Dollar Rent A Car licensee with locations in Seattle and Portland, including the Portland International Airport and Seattle-Tacoma International Airport. The award was presented during Tuesday’s closing seminar. Cassan and her husband James opened the first Dollar Rent A Car franchise outside of California in 1968. Cassan served as one of the original board members for ACTIF (Association for Car and Truck Rental Independents and Franchises), the predecessor to the current ACRA. In addition, she was the first female to serve as the Car & Truck Renting and Leasing Association (CATRALA) president at a state level. Recently, Cassan has been involved with legislative issues including Proposition 1 or the “Living Wage Measure” in SeaTac, Wash. 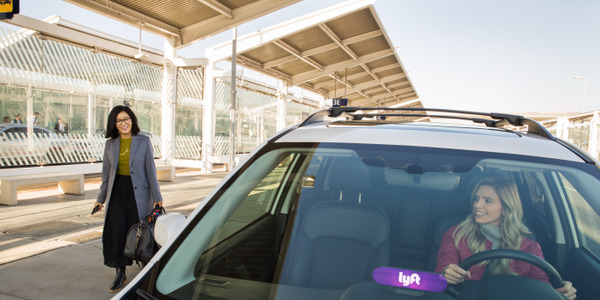 This initiative would increase the minimum wage to $15 for all transportation and hospitality employees in the city of SeaTac and at the Seattle-Tacoma International Airport. Cassan, along with ACRA, opposed the initiative. “The government should not be getting involved in the day-to-day operations and employee standards of a private enterprise,” she said. In 2011, Cassan was involved in opposing Senate Bill 5958, a proposal to extend some taxes on car rentals, hotels and restaurants to pay off Seattle’s Safeco Field. Cassan helped contact legislators to successfully defeat the bill. “Doris Cassan represents what is the best in every car rental operator: devotion to excellent customer service, devotion to staff and devotion to the betterment of the industry by working with the American Car Rental Association to further develop our mission of championing the legislative matters that affect our industry,” said Sharon Faulkner, executive director of ACRA, who presented the award to Cassan. 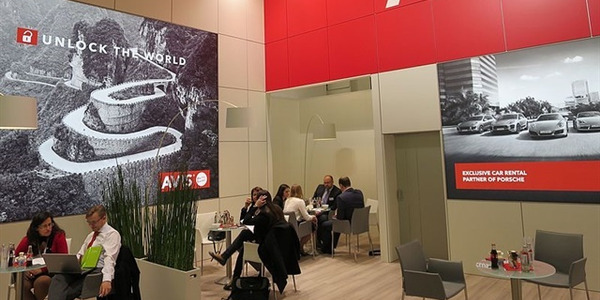 To address a growing portion of attendees from Central and South America and the Caribbean, CRS convened a meeting specifically designed to address the issues facing car rental in Latin America. Some 28 operators from Argentina, Brazil, Chile, Bolivia, Peru, Mexico, St. Lucia, Costa Rica, Trinidad and Tobago, Dominican Republic, Turks and Caicos, Puerto Rico, Barbados and Aruba attended the meeting on Wednesday. After breakfast, attendees participated in five seminars, presented in both English and Spanish. Topics ranged from the impact of technology in Latin America, how to prepare your books for investment, sales tactics and brand development and a new product showcase specific to Latin American operations. 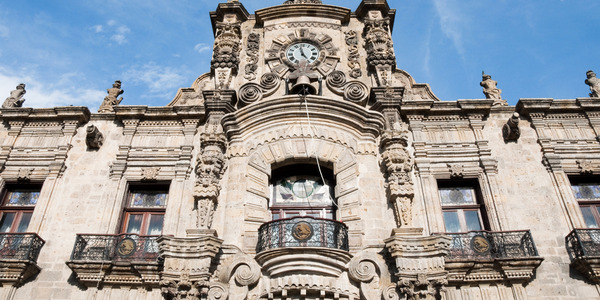 Javier Garcia Gonzalez, business manager of Turismo Gargo, a Mexican-owned Fox Rent-A-Car affiliate, presented a seminar that shared specifics on how his company has grown rapidly in five years. Eddie Crespo, strategic account manager for TSD, presented a seminar on how Latin American operators can leverage technology in their operations. The 2015 Car Rental Show will be held April 12-14 at Bally's Hotel and Casino in Las Vegas. 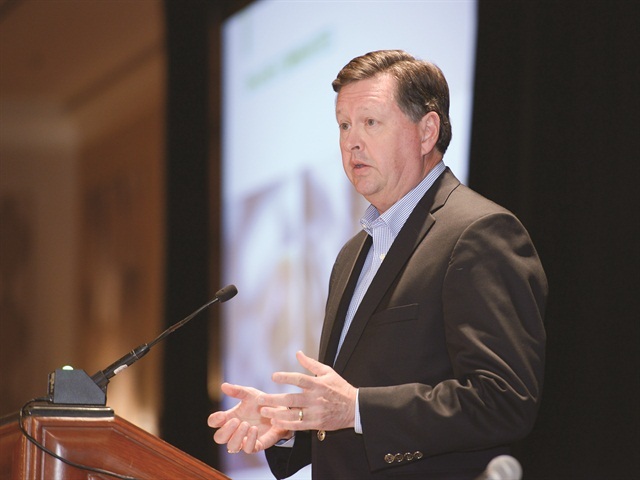 Pat Farrell, chief marketing officer for Enterprise Holdings, delivered this year's opening keynote address. Farrell concentrated on how technology -- specifically mobile technology -- will shape the industry. "Innovation will drive growth, technology will drive growth and customer preferences will drive growth," Farrell said. Joe Knight of Fox Rent-A-Car (standing, right) presents Bob Barton of Hertz a plaque commemorating his six years of service as president of ACRA. Knight officially succeeded Barton as president during the ACRA seminar. 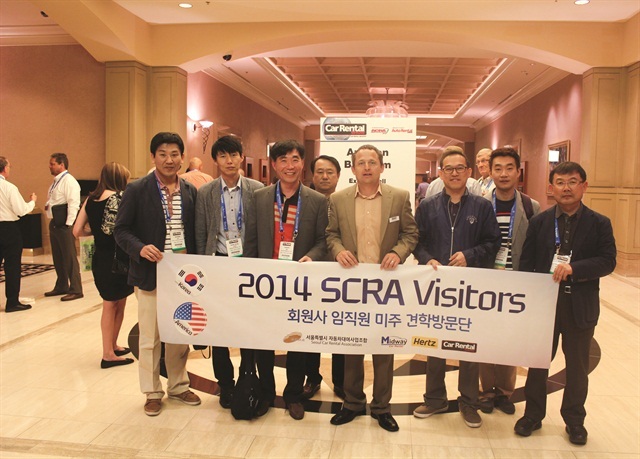 A delegation of Korean car rental operators representing the Seoul Car Rental Association returned to CRS in greater numbers. CRS also welcomed a delegation of 27 car rental operators from China. Total attendance from outside the U.S. was 32% of total registrations this year. 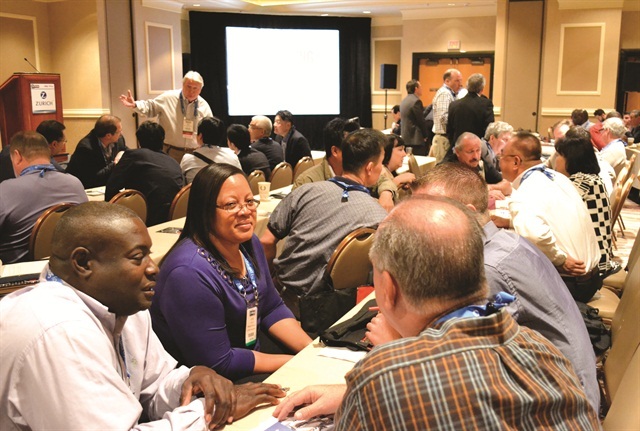 During the second annual First-Timer's orientation, old-timers and newcomers exchanged business insights during a structured networking session. The closing keynote seminar featured a blue-ribbon panel on prepaid reservations and the opportunity to better manage no-shows and utilization. Special guest Dr. Stowe Shoemaker of the Harrah College of Hotel Administration at UNLV (far left) shared pricing strategies in the hotel and airline industries. The exhibit hall featured 94 vendors, ranging from traditional auto rental products and services such as software systems, cleaning products and lending institutions to newer, outside-the-box solutions such as high-tech locksmiths, mobile ATMs, fuel reclamation services and car-sharing technology. 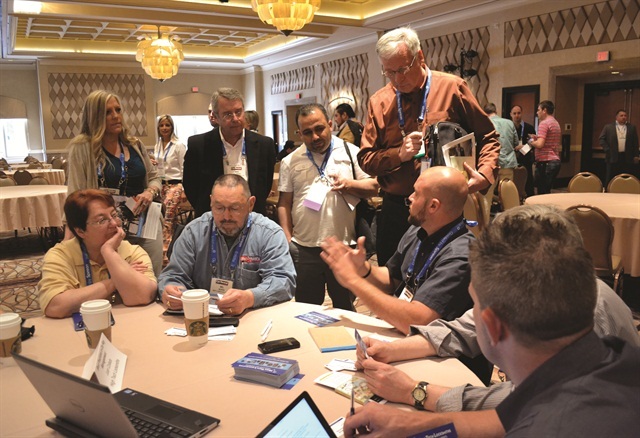 The two-hour roundtable sessions on Monday morning featured 10 tables, with participants rotating through 10 discussion topics every 20 minutes. Topics included preparing better financial statements, best practices in damage charges, effective counter sales tips and implementing self-service car rentals.